In our last article, we performed mapped inheritance between classes to database using Hibernate. By default, Hibernate uses a single table strategy to perform inheritance between the classes. And, there is another way through which Hibernate performs implement inheritance using single table inheritance i.e. by using specific annotations with Hibernate. Today we are going to understand how to map inheritance between the classes to the database using annotations with Hibernate. By using annotations, we can configure the table name, column name and the values in dtype column of the single table created by Hibernate to implement inheritance. Let's take the same example of an Entity class - Country, which is extended/inherited by two classes AsianCountry and EurpoeanCountry. Now, let's see how Hibernate performs object-relational-mapping(ORM) to represent the inheritance between these three classes in the database, by using annotations. In the upcoming example, We are going to create a Java class which will be mapped to a table in our database(Oracle Express Edition 10g). We are going to use some Hibernate Annotations, hence, there will be no need to create the mapping-resource with extension hbm.xml . For those who are not aware of Hibernate Annotations, please read Hibernate Annotations for reference. And yes, one more thing, we are going to create this program in an Integrated Development Environment (IDE), so you may use any IDE of your choice. We are going to create a general parent class that will contain all the Java code files representing our Model class(whose objects needs to be persisted). This parent class will be inherited by a few child classes that we are going to create later on. This is a simple Java class whose objects needs to be persisted/saved, these objects are also known as Plain Old Java Objects(POJO) or Entity class. Some may even refer to such class whose objects needs to be persisted as the Model class. This class is an entity class, hence it will be preceded with the @Entity annotation plus a few other annotations described below. @Inheritance - This annotation is placed just above the parent Entity class, which tells the Hibernate that this class is the parent of inheritance relationship with other classes. The strategy element of @Inheritance annotations tells the Hibernate the strategy used to perform inheritance and for now we are going to use the default strategy - InhertanceType.SINGLE_TABLE. @DiscriminatorColumn - This annotation allows you to change the name and type of column named dtype which was created by default when Hibernate performed inheritance without annotation. Next, we are going to create the child Entity class inheriting from the parent Country class. The object of this child class will also be persisted in the database table. The object of this class will contain a few specific properties such as continent and population to save these specifics about each country. This class is also an entity class, hence it will be preceded with the @Entity annotation plus another annotation described below. @DiscriminatorValue - This annotation allows you to change the name of class displayed in the dtype column which was created by default when Hibernate performed inheritance without annotation. Next, we are going to create another child Entity class inheriting from the parent Country class. The object of this child class will also be persisted in the database table. The object of this class will also contain a few specific properties to capture information about each country, such as its continent and population. This class is also an entity class, hence it will be preceded with the @Entity annotation plus another annotation described below. This class will create some User_Details objects , which will be persisted using the Hibernate API and an object-relational mapping(ORM) in the database is performed. The Hiber class creates a Configuration object, used to configure the Hibernate. This is the first object we use when using the Hibernate. This object is used to specify the location of a configuration file and mapping document used by Hibernate. Using Configuration object we can create a SessionFactory object, which is eventually used to create a Session object to perform the object persistence operations. Note : We will not need to set the Id value of each object of parent class Country, as it is automatically done by using Hibernate's @GeneratedValue annotation. We are going to add some JARs files to the build path of our Java project. These JARs make the Hibernate work with our database using a specific JDBC Driver for our particular database. All these JARs are included in the folder named required(within our Hibernate installation folder). So, we need to add all the JARs in the required to our build path of our Java project. Finally, we are going to add one more JAR file. 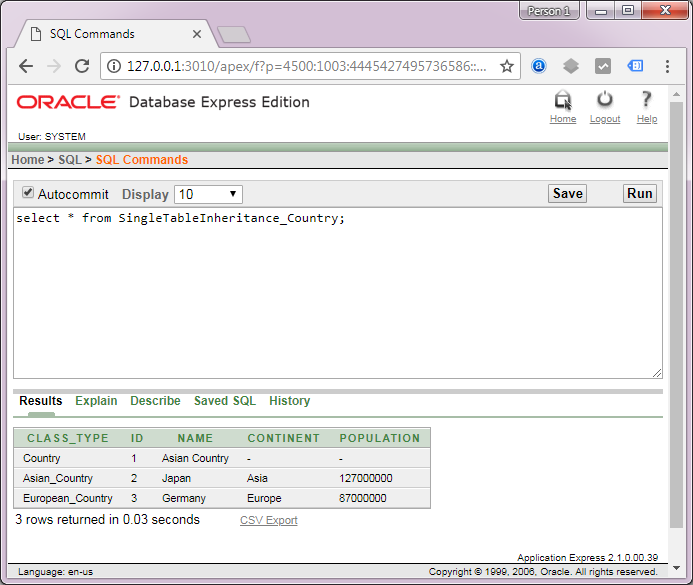 This is a specific JDBC JAR file(ojdbc14.jar) required by Hibernate to connect to our database(Oracle Express Edition 10g) and perform object-relational mapping and object persistence. Note : Those who don't know how to add JARs to the build path of your Java project in Eclipse IDE, please refer to our section Adding JARs to your Hibernate project in Eclipse. Next, we are going to add a configuration file to our project. This configuration document ends with an extension .cfg.xml, and it is named as hibernate.cfg.xml. A database to which Hibernate connects to perform object-relational mapping and object persistence. The JDBC driver class for our specific database, used by the Hibernate to connect to the database. The username and password of database, using which the Hibernate connects to the database. An SQL Dialect, used by the Hibernate to instruct the database. A Entity/POJO class which will be mapped to a database table by Hibernate. A command to echo all the SQL commands which are executed by the Hibernate on stdout. The mapping entity class, used by Hibernate to correctly map the class to a database table. We will specify all three Entity classes Country, AsianCountry and EuropeanCountry involved in inheritance. The picture above depicts how and where to arrange POJO/Entity(.java) file, its two child Entity classes and the class(that calls the hibernate into action) in a specific directory structure. Project Folder - HibernateSingleTableInheritanceAnnotation is the name of our Project and it is a top-level directory. This project folder contains the main package of our project i.e. decodejava, which contains POJO/Entity class file i.e. Country.java, its first child class i.e. AsianCountry.java, second child class i.e. EuropeanCountry.java and the class that calls the hibernate into action i.e. Hiber.java. Besides this, the project folder also contains the hibernate configuration file i.e. hibernate.cfg.xml, and as we have used some Hibernate Annotations in this project, hence, there will be no need to create the mapping-resource with extension hbm.xml . 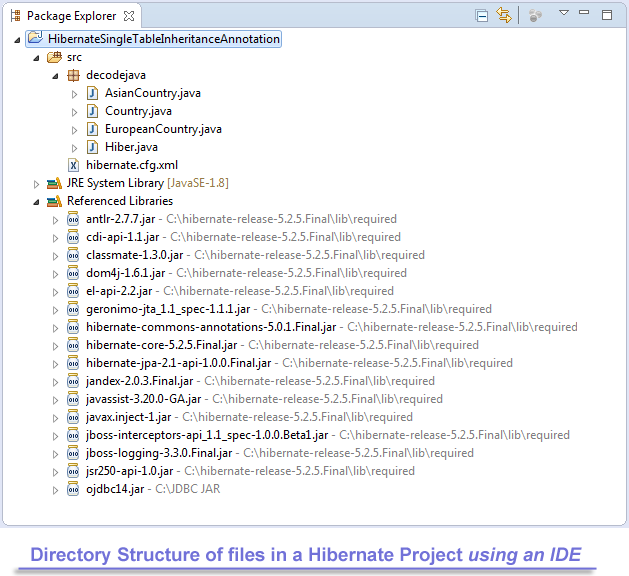 The project folder also contains all the needed Hibernate JARs present in the required folder of Hibernate installation and the JDBC JAR file(ojdbc14.jar) required by Hibernate to connect to our database. This output shows you all the SQL commands executed by the Hibernate within the database to map the inheritance between the Java classes to a database table and perform all the activities of creating the tables and saving the objects of all three Entity classes. SingleTableInheritance_Country, representing the inheritance between the three classes in the database. The objects of the parent Country Entity class. The objects of child AsianCountry Entity class. The objects of another child EuropeanCountry Entity class. This table shows you how hibernate has presented the inheritance between the three classes using annotations and have allowed us to configure the table name, column name and the values in dtype column(which was created when we didn't use annotations) using the default single table strategy. In the upcoming articles, we are going to look at more strategies used by Hibernate to implement inheritance between classes.